Rich-toned, subtly complex. Pineapple, sandalwood, jasmine, honey, cocoa in aroma and cup. Deeply sweet in structure with juicy acidity; plush, syrupy mouthfeel. The resonant finish leads with cocoa-toned pineapple in the short, rounding to jasmine in the long. Produced entirely from trees of the Red Bourbon variety of Arabica and grown on Hula Daddy’s higher farm at 2,500 feet. This presentation is named for co-owner Karen Paterson, whose middle name is Jue and whose favorite coffee is the Red Bourbon. 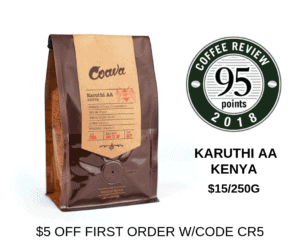 This coffee tied for the second-highest rating in a cupping of coffees roasted by women for Coffee Review‘s April 2018 tasting report. Hula Daddy is a boutique coffee producer with farms at the 1,400 and 2,500 foot levels of the Mount Hualalai volcano near the northern end of the Kona growing district, five minutes above the town of Kailua-Kona. This coffee was produced at the higher elevation Hula Daddy farm.Visit www.huladaddy.com or call 888-553-2339 for more information. The Bottom Line: A complexly nuanced Kona-grown Red Bourbon, rife with sweet fruit and floral notes supported by undertones of rich sandalwood.